After seeing the season finale of HBO's "Game of Thrones" I was inspired to revisit my Harbinger wallpaper and create a new version for fans of the series (and myself) who are waiting impatiently for season 2. 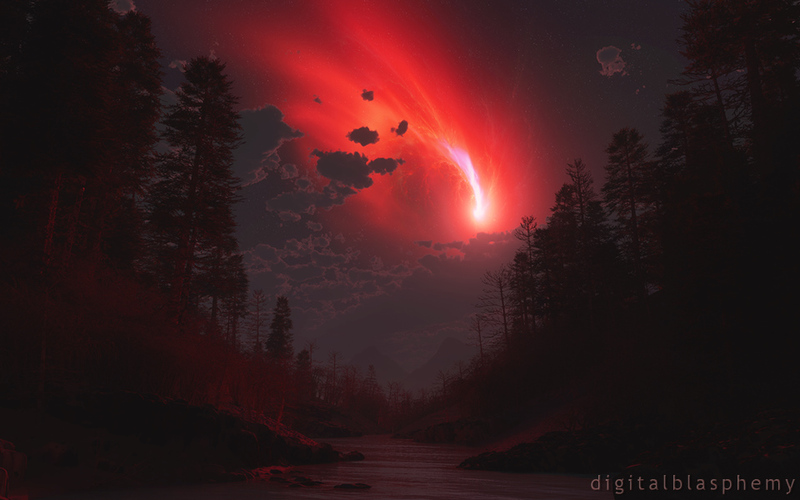 This one depicts the blood red comet that hangs ominously over all of the happenings in Westeros during the second book. The blue Harbinger was the first wallpaper I worked on after a long, very arduous, hospital stay in 2009. Reading "Clash of Kings" during that time was truly one of my few joys at the time. I had originally posted this in my Pickle Jar, but the reaction was so positive that I decided it had earned a place in my gallery. I still love this wallpaper, originally before reading the inspiration was Song of Ice and Fire, it came across as the comet in the North from the Black Company, especially as it was called Harbinger in the book. Might be something others would be interested in as well. Sometimes it is easy and sometimes it takes a couple of hours but I think the title is very important. I have an English degree and I was a writer before I was a visual artist. That part of my creativity comes out in the naming process I guess. Just a point of curiosity..how do YOU come with the names for all your creations??!! Bye the bye..I think your work is EXCELLENT!!!! I was looking at this before I read the notes on it and my first thought was the comet in Clash of Kings! Thanks for bringing that to life! NICE! There is so much more from the book that could inspire more paintings. Keep up the great work & I to am dreaming of part 2 coming out. This is better than the original Harbinger. I think it is the use of red and the red lighting on the trees. Very lovely. This is so unbelievably beautiful! I'm picturing the night that Dany looked up into the sky and saw the red comet, and lit the flames. "And for the first time in a hundred years, the night was alive with the music of dragons." I think this is the best version of Harbinger to date. Great work. I have so much fun sharing your stuff through my monitor at work. I get many comments. This one will be sure to generate some good ones. BTW I was buying myself a new iPad2 at the local Apple store last weekend (happy Father's day to me lol) and when the staff saw my "Highland Summer" iPhone backround they were blown away that that was a render, and started to show it around! Keep up the good work!!!!! I really like this piece. I was worried the comet would be split badly between my two monitors but it manages to make it to the right monitor enough to not distract. This is good enough it just uprooted interopposite which I didn't think was going to happen this soon! And, I now have a new trilogy to read on my bus ride to work (I hadn't heard of Song of Ice & Fire before)! Something about the choice of colors, the shading... I don't know. Perhaps those posters who are professional artists can give the proper terms. But whatever it is, it just WORKS, and works WELL. I like the look of this more than any wallpaper I have ever downloaded here, in all by 3 years of membership. I love this -- and you did it so fast! And thank you so much, Ryan, for beginning work on the "Enshrouded" multiscreens. I can't wait!! Harbinger was always a top rated image and this one actually surpasses it in my book. There is something so riveting and even realistic about this that the first failed to fully capture. Bow down to Bucephalus!!! The light source aside, this scene looks incredibly real. I don't know if it's just the change in lighting, you tweaked the scene settings, or I just never noticed it in the original blue version, but it's amazing nonetheless. I like the perspective from the river... any chance of a daytime version, maybe with a planet or some other visual interest in the sky so that we can see more detail on the trees & landscape? Ryan, I always thought the original Harbinger was one of your best, but I think I like the red version even better! "Moved to the Main Gallery"
The reaction to this render has been so positive that I've decided it should be featured in my main gallery. Thanks everyone!